Britain, already infamous for its gastronomical failures, isn't doing much to improve its reputation for inedible food. Are you in England? Do you have Findus beef lasagna in your cabinet? FUUUU, take it back to the store! 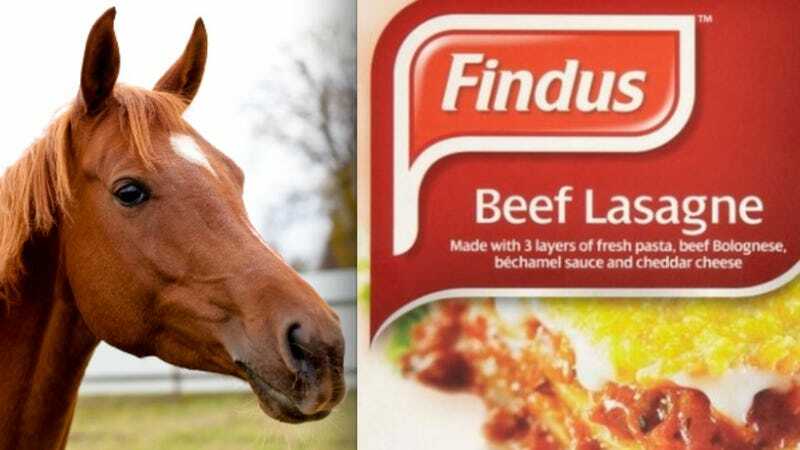 Eighteen beef lasagna products were tested by Findus, which found that 11 contained horsemeat in the 60 to 100 percent range, the Food Standards Agency said. It would not say if any of the meals were 100 percent horsemeat. So, yes. Yes, at least one of them was totes entirely horse. Perhaps the horseshoe at the bottom of the box tipped you off. Although horse meat isn't unsafe healthwise, it does "trigger disgust" in the U.K. (fair enough), as well as a single tear from anyone who's read Black Beauty. Ireland is blaming Poland and Romanian manufacturers for the diluted meat, who in turn deny it. The head of the U.K. Food Standards Agency has announced that there will be a comprehensive testing for horse meat on all beef products, which incidentally sounds like it could be a line in Magic Mike 2. Anyway. Horse meat. Jesus.